Being a horse is confusing sometimes. You get on a trailer, spend a couple of hours with your balance constantly changing, back off the trailer when it stops and you’re somewhere new. Maybe you are going to a new owner. The trailer drives off and you are in a place where every variable in your life has changed. New surroundings, new person to interact with, new horses to meet, new pecking order to establish, maybe new food and maybe water that smells funny to you. Quite possibly, new rules from the new handler. It can be a scary time for a horse. Here are some tips I find useful in helping horses to relax and perform when they arrive at a new or temporary home. Horses, you may have noticed, don’t talk much generally. There is the occasional outburst and some friendly nickering or “meet the new guy” posturing sounds, but generally, they’re quieter than humans. They are into physical cues. They read energy for the most part. When you approach a horse with the attitude of Benevolent Dictator (BD), that person who will assume the position of making decisions for both parties, but who will put the horse’s needs to the forefront, you will be given right of way as leader by the horse and the experience of being the follower will relax the horse. The two parts of Benevolent Dictator nest into each other. For instance, sometimes when a horse is in a new situation, he will exhibit resistance to being led, either figuratively or literally. Maybe he literally will not move, or maybe he is whinnying himself silly and skittering about. At this point, the BD is wise to employ the Miz Scarlet Effect a brief, but moderately strong suggestion, repeatable as needed, that the horse’s best interest is served by having his attention on the handler and following directions. 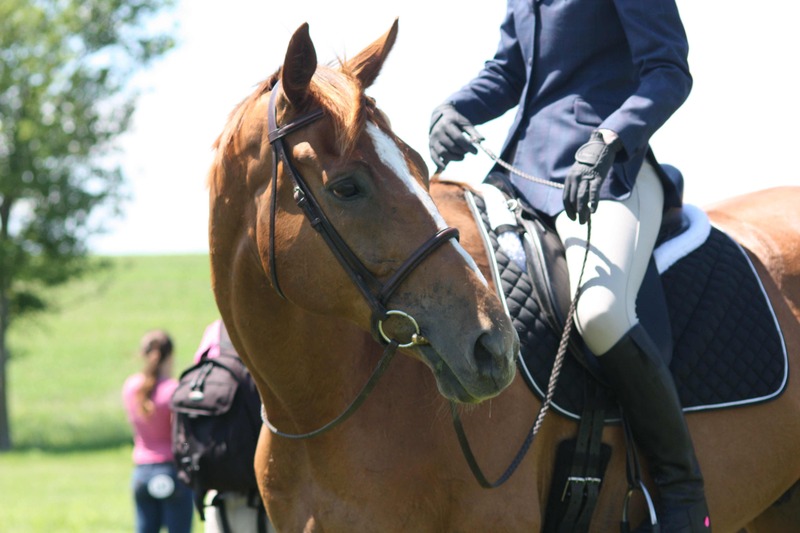 This correction is both a Benevolent and Dictatorship act because horses and handlers are safest when their attention is focused in the same direction. Benevolence is also manifested when the horse is praised when he keeps his attention on you. The Benevolent Dictator makes being with her more fun and relaxing than “being”, physically or mentally, somewhere else. No fingers also means no Q-tips. Horses’ ears get waxy or itchy just like ours do, but again, the no finger thing. That’s where you step in and help and make an instant friend or at the very least find out more about your horse. Put a kleenex on your finger and gently put it in his ear and see if you can gently rub some of the dirt/wax out. Some horses love this, some horses wonder what in the heck you are doing and please maybe not so much of that. If not, let it be. Just offer and see what happens. The ones that love it do this funny thing with both their upper and lower eyelids that I have only seen them do when their ears are cleaned, and all horses who like it make the same face. Must be the universal ear delight face. It is hysterical and you’ll know it when you see it. Many horses also have a swirl of hair in the middle of the bottom of their bellies where the flies love to bite. Scratch this. Then put swat on it. More good thoughts to you from horsie. While you are distributing all this Benevolence (and feeling the love back), the Dictator is also there, making sure basic rules are followed. If horsie looses focus and starts whinnying or skittering about, invoke your right to a swift Miz Scarlet Effect, growl for a maximum of two seconds and then let it go and proceed back to Benevolence mode. If you made that quick energy change in an interaction with a person they’d call you Sybil. When you do that to a horse, they are happy to have gotten clear direction. And they usually step happily right back in line. Moving backwards down the horse’s body, if you have a mare, run your hand along her belly until you reach her teats. If she will allow it, check between her teats for icky crusty stuff. It builds up there and I bet it itches like heck, because most mares are delighted to have you gently remove it once they figure out what you are doing. Meanwhile, they are also figuring out that your intentions are good. This goes a long way to improving their confidence in their environment and you. A confident horse is a safer horse. If you have a gelding, it gets a little more complicated as they can telescope their thingies into the netherworld and most people aren’t going to go spelunking after it. Some geldings, though will welcome you removing some of the dead skin off of their winkies if you are gentle, and don’t tell me that doesn’t feel good to the fingerless-types. This is all entirely trust building through hygiene. When it is time to do the soft-brush-on-the body routine, get a seriously soft brush. If you can run it down your cheek and be happy, you are there. Start with the top of the horse’s head. Move the forelock to the right and groom the area between it and the ears. Then do the same on the left. Then groom the outside or even upper inside of the ears if the horse will allow it. Then, use long strokes that go from the middle of the face, following the hair, smoothly over the eyes, which the horse will close as the brush goes over, and then down the cheek. Spend a full minute or two on the face alone. Some horses like to have it run down the channel of their cheekbones, underneath their head. As you do this, look at the horse’s reaction of relaxation, slow your breathing and just allow the connection. Many horses will draw a long sigh of relaxation while you do this. The Dictator program is always running in the background, correcting the horse if he starts to rub on you or fidget around or otherwise be distracted. He is supposed to passively allow you to kindly groom his face. When you groom the rest of the horse, if you are not removing mud or having to otherwise scrub, use long strokes and breathe long breaths. Let your free hand rest on the horse, having placed it there palm first. I haven’t quite figured out why, but if you watch really good horsepeople, they rest their whole palm on the horse and feel, rather than let their free arm hang or spider their fingers over the horse, with their palm held away. Regardless of the reason, horses relax when touched with the whole palm in long strokes in the direction of the hair. At will. And the people who say not are silly meanies. Yes, you should do it for all the reasons you know you should, but you should also do it because a horse who will calmly shift his weight to his other legs and allow you to futz with the remaining one is a horse who is confident in you. Spend time getting this right. Not just holding it in the air for the 8 seconds it takes you to pick it, but spend time helping them learn that yielding their body to you is not scary. This isn’t just a “yes” or “no” will-he-pick-up-his-feet-for-cleaning thing. This is a connection thing. When a horse does this efficiently and confidently, the ride goes well. If I have a horse who isn’t calm and relaxed in yielding his body to me in this manner for whatever reason and we don’t resolve it, it tells me I have more work to do on the ground, and I’m not getting in the tack today. No biggie, glad to know it before I am in the tack. Time spent getting this right and getting better connected is always well spent. Lots of horses like to have their heads held. What? Seriously. Lots of horses, when they are relaxed and in a calm environment, like to have their heads held by their people. Several, ok all, of my horses will walk up to me and place their whole head right in front of me so that I can put one elbow over their nose and one elbow over their upper neck, which puts my face in the perfect position to kiss them right behind their ears. They love this. They make big happy sighs and will stay there as long as I do. They relax their necks and curl around me. You don’t want to rush into this or even have it as a goal because some horses are more into it than others and horses’ heads are heavy and solid and can move very quickly and hurt you. You wouldn’t rush in and kiss a person you don’t thoroughly know wants you to kiss them. Same or even moreso with horses. When we put ourselves in the position of Benevolent Dictators, taking both aspects of that title to heart, we open a channel to greater connection to our horses. This relationship is one of caring and empathy with a lack of fear in both parties. When we have greater connection we have more trust and relaxation from both handler and horse. When we have trust and relaxation, horses are more likely to react predictably and calmly. Even when things don’t go perfectly, a horse who has been handled with consistent Benevolence and Leadership is likely to look to its leader for relief rather than improvising his own. Eddie the 17h tb says, "Knee high by the Fourth of July?" I was out on a hack today with my eventer, Eddie. We do a lot of hacking around for conditioning on the land our kind neighbors allow us to ride. Most of it is CRP ground, but there are a few short stretches of crop ground we sometimes pass through. This spring it was easy to hack on down between the corn rows, avoiding the small plants, but in the last week, aided by a lot of rain and then a week of sun, the corn has shot up to the extent that 17h Eddie found himself having to stretch his neck up in order to see anything in the sea of cloying corn leaves. Temple Grandin wrote a great book called Animals in Translation. One of the many theories she puts forth in the book basically says that the lighter-built animals within a type of animal are generally more sensitive and quick-to-react to outside stimuli than their heavier-built counterparts. I tend to think of the more reactive animals as “brighter” though I note that I don’t mean this to mean more intelligent. I think of those animals that are slower to react as “duller”, and this does not imply less intelligent, just less reactive. So, for instance in dogs, a greyhound might be considered brighter than a newfoundland and a draft horse might be considered duller than an arab, just on Temple’s theory alone. Temple goes on to say that the lighter animals within a breed are usually brighter too. So a spindly-legged tb could be predicted to be brighter than a more solid-type tb. This holds true in my experience in general and in my barn at the moment. Charlie, our foxhunter, is a bigger, heavy tb, still purebred, just heavier-boned, and he’s just as steady and sweet as the day is long, and he’s not given to over-reaction. Eddie is a skinny, long-legged, long-necked wisp of a narrow tb and he is as bright as they come. He is given to Anxiety Groans when he is uncomfortable or doesn’t understand things and I guarantee that if there ever really IS a mountain lion near us, he won’t be the one it gets. So, now I’m on a hack with Eddie the Bright in a cornfield up to his ears, with the leaves pressing against his body from muzzle to croup, withers to hooves. He gets light on his feet. He lets out his Anxiety Groan. He breathes faster. He champs at the bit and his pace quickens. I simply put him in a shoulder fore (really, it’s no problem, the corn row limits the angle, like bumpers in a bowling alley) and let the distraction of its effort, combined with a consciously relaxed elbow, quiet hugging leg and steady breathing, settle him. He gets to the other side with little problem. Eddie’s little moment of anxiety, though, reminded me of the progression of learning how to ride. When I was a kid, I had the Greatest Shetland Pony in the World, apparently, judging from all the horror stories I hear of other peoples’ experiences with shetlands. Cricket and I spent many afternoons playing cowboys and indians with my sister and her horse, who was born at our house and who we imaginatively named Grasshopper, since, if you have a Cricket, you obviously need also a Grasshopper. We were 8 and 14, and thought we were clever. Oy. Anyway, a favorite tactic of Cricket and I was to enter a cornrow at the end and pretty much gallop down it to get away from my marauding sister on her much faster horse who was too wide to follow. Cricket was entirely unfazed by the lack of visibility, swinging corn ears and pressing leaves as we bucketed down the row, partly because he knew I would pick something delicious for him to eat once we escaped the marauder. Then I had my friend Ruth out and we went for a ride, me on Cricket and her on Mariah, a big, kind morgan we had. Mariah was a beautiful, well-mannered bay, and quite tolerant. So I was surprised when I led Ruth, trotting down the corn row, only to be rapidly passed by a white-eyed Mariah and clutching, shrieking Ruth. I had no idea that the claustrophobia of the leaves and the lack of ability to see over them could cause a horse to do that. At that moment I became aware of my incompetence. The first step in learning is Unconscious Incompetence where I had merrily lived before that moment. I had been enjoying, unaware, the benevolence of the Sprites Who Protect the Ignorant. Now I was in the land of Conscious Incompetence, with all the heaviness-of-being it brought. Conscious Incompetence, to me, was extremely uncomfortable and I had to move on ASAP. I soon learned the power and usefulness of being able to influence the individual parts a horse’s body. When a horse’s body is yielding to the rider’s leg, and when his poll is relaxed, it is easier for him to stay mentally with the rider and to relax. 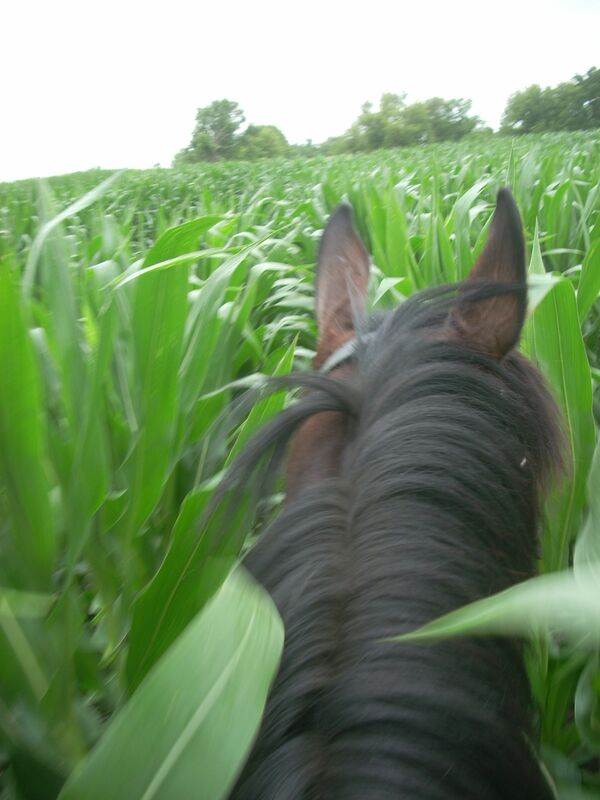 If the horse and rider are trained properly, they can communicate in times of crisis, such as when a horse can’t see over the corn leaves and they are being touched all over by the leaves. I could put Mariah in shoulder in in the little grass paddock we had, could I do it in a corn row when she got worried? The short answer was no, not for quite a while. I needed to have the connection without effort, to have it in my muscle memory. Unconscious Competence comes to those who are motivated to put in the work, and time is undeniably an element of work. It took a lot of practice in the arena before our communication was good enough to be helpful to the horse in an anxious situation. But it did come for us, and it was really fun to canter a big horse down the corn row! Whatever you want to do, be fearless. Be hungry, try, make mistakes, endure setbacks. Celebrate every victory. Learn from every setback. Put your eye on the prize and do not take it off. The beauty of Conscious Competence is that it dances with the one that paid the cab fare. Do you have the change?